International departure taxes of $120 plus current fuel surcharges of $300 are included (subject to change). Today we depart Atlanta and connect with our overnight flight aboard a wide- bodied jet. We enjoy in-flight movies, dinner and breakfast aloft. We arrive at Lisbon Airport, where we are met and given a short orientation tour of Lisbon before the drive to Fatima. If possible, we celebrate Mass at the Church of the famous Eucharistic Miracle at Santarem. Balance of the day at leisure. Dinner and overnight at our hotel. In the evening, we join the International Rosary Procession. This morning before we leave Santander, we celebrate Mass at a local parish. We continue eastward along the Basque coast via San Sebastian and crossing the border into France. 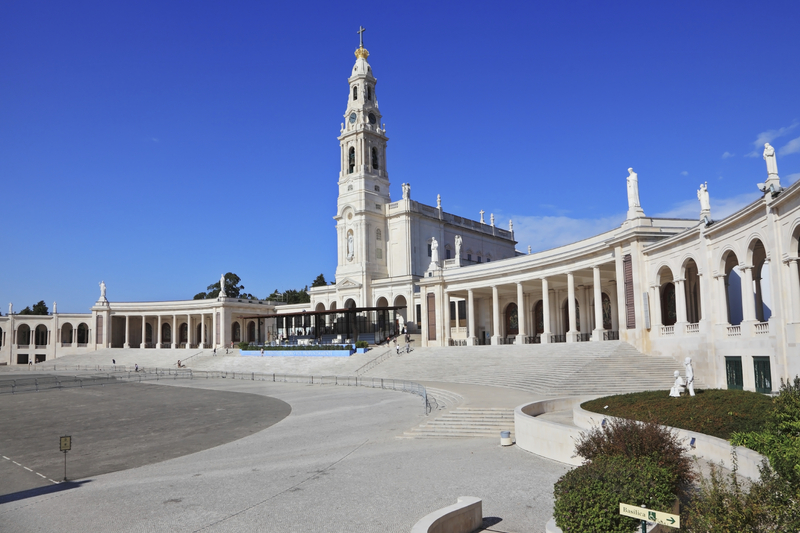 En route we also stop at the Basilica of St Ignatius of Loyola and pay homage to Saint Ignatius the Spanish Basque priest and theologian, who founded the religious order called the Society of Jesus. In the late afternoon we arrive in Lourdes for dinner and overnight at our hotel. In the evening, we have the opportunity to join the Torchlight Marian Procession. This day is spent in devotion to Our Lady of Lourdes. We celebrate Mass at the Grotto, visit the Shrine and enjoy a walking tour of Lourdes. We will also visit Boly Mill, where St. Bernadette was born, the Cachot, formerly used as a jail, where she lived during the apparitions, and the parish church. There will be free time for private devotions, the Eucharistic Procession, the Blessing of the Sick or the legendary, and entering the healing waters of the miraculous Lourdes spring. Dinner and overnight at our hotel. In the evening, we can once again join the Torchlight Marian Procession. This morning we depart Lourdes and traverse the Pyrenees southward entering northern Spain. We drive to Montserrat on the outskirts of Barcelona and celebrate Mass at the Monastery housing the famed Madonna Black. If possible, we enjoy the mid-day music of the famous boys’ choir here. Dinner and overnight at our Monastery hotel here. This morning we drive to Barcelona to celebrate Mass at the Cathedral. Afterwards we through the Gothic quarter bisected by the famous Ramblas and see the important new developments at the pleasure port where many of the Olympic events were held in 1992. We enjoy a spectacular view from the top of the Montjuic hill, pass by the Exchange and visit the Church of the Holy Family or Sagrada Familia, the still uncompleted masterpiece of Antoni Gaudi. Afterwards we visit the Unesco World Heritage "Park Guell" one of Gaudi's Masterpieces of "landscape architecture.” We enjoy our farewell dinner in Barcelona at a local restaurant, with entertainment. We return to Montserrat for dinner and overnight at our hotel.